Does the Libya intervention amount to a “war” in constitutional terms? Samuel Johnson’s influential 18th century dictionary defined “war” broadly as “the exercise of violence under sovereign command, against withstanders.” International law writers of the time expressed similarly expansive definitions. Although there are surely borderline cases, our use of force against Libya easily qualifies: the opponent is the Libya government, and our objective is to use “violence under sovereign command” to force that government to change course. Why can’t the President begin a war informally, merely by ordering an attack, without a declaration? The answer is that in founding-era terminology war could be “declared” either by formal announcement or by military action initiating hostilities. John Locke’s classic Two Treatises of Government from the late 17th century referred to “declar[ing] by word or action.” Blackstone and Vattel, two of the 18th century legal writers most influential in America, also used “declare” in this way. Vattel wrote: “When one nation takes up arms against another, she from that moment declares herself an enemy to all individuals of the latter.” Johnson’s dictionary gave as one definition of “declare” to “shew in open view” – which, applied to warfare, would obviously encompass military attacks. (References are found in my Chicago Law Review article, Part III; for a more comprehensive account, see this outstanding article by Saikrishna Prakash). Thus in 18th century terms initiating an attack was as much “to declare war” as was making a formal announcement; Congress’ Article I, Section 8 power is not narrowly about issuing formal announcements, but broadly about authorizing the sorts of actions that begin war. If Congress’ power is to decide when war should begin, it follows that the President cannot independently launch attacks. The meaning of the war clause was thus settled at the dawn of the republic. The word “declare” enjoyed a settled understanding and an established usage. As early as 1552, the verb “declare” had become synonymous with the verb “commence.” They both mean the initiation of hostilities.31 This was the established usage in international law as well as in England, where the terms declare war and make war were used interchangeably. This practice was familiar to the Framers. As Chancellor James Kent of New York, one of the leading jurists of the founding period, stated: “As war cannot lawfully be commenced on the part of the United States, without an act of Congress, such an act is, of course, a formal official notice to all the world, and equivalent to the most solemn declaration.” While Kent interpreted “declare” to mean “commence,” he did not assert that the Constitution requires a congressional declaration of war before hostilities could be lawfully commenced, but merely that it be initiated by Congress. What is “essential,” according to Kent, is “that some formal public act, proceeding directly from the competent source, should announce to the people at home their new relations and duties growing out of a state of war, and which should equally apprize neutral nations of the fact.”32 Thus, Congress need not declare war. All that is required under American law is a joint resolution or an explicit congressional authorization of the use of military force against a named adversary. The framers carefully studied this monarchical model and repudiated it in its entirety. Not a single one of Blackstone’s prerogatives was granted to the President. They are either assigned entirely to Congress (declare war, issue letters of marque and reprisal, raise and regulate fleets and armies) or shared between the Senate and the President (appointing ambassadors and making treaties). The rejection of the British and monarchical models could not have been more sweeping. The War Powers Resolution (or “War Powers Act”), a joint resolution which passed in November, 1973 (284-135 in the House, 75-18 in the Senate) over the veto of President Nixon – like all measures enacted by Congress (obviously, to us, if not to our federal representatives of late) – had to comply with, and could not revise or amend, the Constitution – in particular, here, the plenary power of Congress (see above) to commit our Armed Forces into hostilities, except when unable to act in advance of a presidentially-ordered emergency defense against sudden attack on the nation or its forces. Thus, any responsible, honorable interpretation of the statute codified as 50 U.S.C. §§ 1541-1548 [Public Law 93-148; 87 STAT. 555, as amended] would first examine the required allocation of war powers under the Constitution, and then turn to divining the will of the Congress that passed the War Powers Resolution, as expressed in the legislation’s plain text. That is, an objective interpreter – particularly one serving in the Department of Justice, an agency tasked with helping the President to fulfill his far-reaching and profound Constitutional duty to “take care that the laws be faithfully executed” – would not merely seek to serve the ever-present desire of presidents for more power, by searching for any semi-plausible loophole in the law’s language to try to exploit (while the Judicial Branch dangerously continues to essentially refuse to pass judgement on or to enforce the War Powers Resolution on its merits). Whether or not the War Powers Resolution is followed in part, or at all, in practice today, given the long absence of effective enforcement of its terms by Congress and the judiciary, ever-present advocates of a form of American monarchy – who shamelessly pretend that the legislation vetoed by Nixon is simply a subtle, implicit admission by Congress that the President unilaterally holds in his hands the non-emergency power of war and peace for this nation – have both the well-documented Constitutional intent of the Declare War Clause, and the explicit “purpose” and “interpretation” language of the War Powers Resolution itself fully and solidly arrayed against them. See, for example, Letter from Assistant Attorney General Walter Dellinger to Sen. Robert Dole et al., (Sept. 27, 1994) in 140 CONG. REC. 140, at S14314 (1994) arguing that the War Powers Resolution “recognizes and presupposes” presidential power to initiate some [non-defensive] hostilities for less than 60 days. Read in that light, the War Powers Resolution grants to the president an unlimited, discretionary authority to choose war or peace. For the past half century, presidents have resorted to the use of word games to justify their military adventures, but semantics are a poor substitute for legal analysis. On 29 June 1950, at a news conference, President Truman denied that the United States was “at war” in Korea. Rather, it was a “police action under the United Nations.” In fact, it was an American war – measured by troops, money, casualties, and deaths – from start to finish. A federal district court noted in 1953: “We doubt very much if there is any question in the minds of the majority of the people of this country that the conflict now raging in Korea can be anything but war” (Weissman v. Metropolitan Life Ins., Co., 112 E Supp. 420, 425 (S.D. Cal. 1953)). When Bush invaded Panama in December 1989, the State Department called it a “humanitarian intervention.” The Organization of American States, pointing to language in the OAS Charter that regards the territory of a nation as inviolable, condemned the invasion by a vote of 20 to l.
A year later, the Justice Department argued in court that Bush could order offensive actions against Iraq without seeking advance authority from Congress. According to this theory, the use of 500,000 ground troops and air strikes fell short of war. As we noted, Judge Greene found no merit in this argument, dismissing it as a mere semantic ploy to avoid the plain language of the Constitution. The Framers recognized that the president might have to respond promptly on his own initiative to “repel sudden attacks” against the United States. But the Framers reserved to Congress the authority and responsibility for taking offensive actions against other nations. The president could repel, but not commence war. As James Wilson explained at the Pennsylvania ratifying convention, it “will not be in the power of a single man” to take us to war. The Framers adopted a set of principles that are fundamental to self-government. The constitutional requirement of congressional authorization for offensive actions represented a radical break from monarchical rule in England, and it reflected the Framers’ commitment to republican principles in the conduct of foreign policy. Word games by presidents to get around this requirement do much to harm and undermine the values of our constitutional democracy. I agree with what Candidate Barack Obama said. We should not go to war without congressional authority. These are the checks and balances that give you a say, that give the people of America a say through their representatives. This allows us to say when we go to war through our Congress, not through one individual but through 535 individuals whom you elect. I think the decision to go to war is such an important one that we should not leave it up to one person. Our Founding Fathers agreed with this. In the 1970s, after Vietnam, we voted on something called the War Powers Act. We did give the President the right to go to war in certain circumstances. These circumstances were, one, if Congress had declared war; two, if Congress had authorized the use of military force, or three, if there was imminent danger to our country. I think all of us recognize that. If we were in imminent danger of attack, we would allow the President some latitude, but we would expect very quickly for him to come to Congress and ask for permission. This is such an important constitutional principle that, while I am new here in the Senate, I am appalled that the Senate has abdicated its responsibility, that the Senate has chosen not to act and to allow this power to gravitate to the President. I think that the precedent of allowing a President to continue to act or to initiate war without congressional review, without congressional votes, without the representatives of the people having any say, is a real problem. Yet here we have a President cavalierly taking us to war. He seems to have had a lot of time to talk to people. He talked to the Arab League. They had time to get together and vote on it. He talked to the U.N. They had time to get together and vote on it. But he had utter disregard and contempt for the most important body in the United States that represents the people–the U.S. Congress. Utter contempt. He has gone to NATO. He has gone to our allies. He has gone to the U.N. He has gone to the Arab League. But he has not had one single minute of debate in Congress. To add insult to injury, he chose to go to war while in Brazil, while Congress was not even in session. This really should not be the way we operate as a constitutional republic. It was in the midst of all this that the President was leaving for South America and Congress was leaving for a 1-week scheduled recess. That is a fact. On the Friday [March 18, the day after the UNSC adopted Resolution 1973, and one day before the bombing of Libya began on March 19th], which is now about 10 days ago, before we left, the President had a conference call and invited all members of the [Party] leadership, Democratic and Republican, House and Senate, to listen to a briefing from the Situation Room about the exact military situation we faced and invited questions and comments from all Members of Congress who were part of that conversation. I was part of that conversation. I listened to it carefully. It became clear to me that the President had laid down certain conditions to U.S. involvement. No. 1, the President said: No American ground troops. No. 2, the President said: This is a war of short duration as far as the United States is concerned; in his words, “days,” not weeks, and he went on to say that the United States would use its unique capabilities to help those allies of the United States who wanted to stop Qadhafi’s killing. He used the phrase “unique capabilities” several times in that conversation. I wasn’t sure what he meant. I learned later in press reports. The United States used technology on the initial air invasion for the no-fly zone that stopped the radar of the Libyans so our planes and the planes of our allies could travel across Libya and stop their planes and tanks without danger. So that was the commitment made by the President. This was a war, to use a phrase in recent years, of choice. It was not a military action that was demanded because we had been attacked on our soil or in our legitimate bases somewhere around the world and we had to defend ourselves immediately. So I am not happy about it. I think it is a big mess. I think Democrats and Republicans have the same unease about it, and I believe it is time for Congress to assert itself more effectively. We had a [secret] briefing last night, 5 o’clock, 6 o’clock. It went 50 minutes. Frankly, I did not get a lot out of it. I heard little that I had not picked up from the cable news networks. We turned on the television this morning, and we saw news about the CIA involvement there, for good or ill. I did not hear that discussed at our briefing. It would have been nice to have heard it straight from the administration’s leaders, rather than seeing it on television the next morning. So this is the kind of situation we are in. It is not acceptable. Congress must assert itself. I am also not happy at the way some resolution [S. Res. 85, introduced March 1 and unanimously adopted with no debate the same day] was passed here that seemed to have authorized force in some way that nobody I know of in the Senate was aware that it was in the resolution when it passed. I am very concerned about that. Lawmakers said they weren’t told much by Secretary of State Clinton, Secretary of Defense Gates, Joint Chiefs Chairman Michael Mullen or Director of National Intelligence James Clapper [during a pair of classified briefings on Wednesday, March 30th] that they couldn’t read in the newspaper or see on television. They said one dynamic was very clear: The administration doesn’t much care what Congress thinks about the actions it’s taken so far. And, as if to add insult to injury, news broke during the House briefing that Obama had already signed an order authorizing covert action in support of the rebels. When asked about it after the first briefing, House members were unaware the president had taken that action. “I have no knowledge of what he signed,” said Maryland Rep. Dutch Ruppersberger, the ranking Democrat on the House Intelligence Committee. Clinton, approached by reporters in a Capitol hallway, refused to say why the order was not discussed in the briefing or whether she felt she had won over skeptics in making the administration’s case for engagement, which many lawmakers say has no clear objective and was undertaken arbitrarily with other crises intensifying across the globe. Senator Carl Levin: On what? First Reporter: Have you had any discussions with the Pentagon about a supplemental? First Reporter: I know Secretary Gates said he thinks he can pay for it internally [using $4 Billion in Congressional ‘add-ons’ to the DOD’s requested budget]. Levin: I haven’t… I’ve been involved in too many other things to do that. 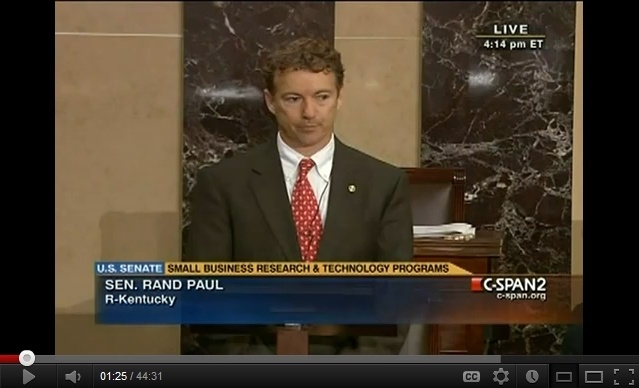 I think the first question is whether – I don’t know if Paul’s… In terms of authorization, the first thing to come up would be Senator Paul’s [non-binding] Sense of the Senate [the motion to commit], and I don’t know if that’s on the list [of amendments to the pending Small Business bill that may eventually be unanimously set for a debate and votes after a week of inaction], and I don’t know what the status is because I’ve been here all afternoon. But [Paul] has a Sense of the Senate resolution, and the first important thing would be to defeat that because that says that – limits the authority of the President to ways which… [pause] …just about every President since President Truman [has been?/inaudible] in violation, so… That’s the first thing that needs to be addressed. Any authorization resolution requires significant time, I think, to put it together, but also even much more time on the floor. It would deserve a significant debate. Levin: I think he has a Sense of the Senate, motion to refer back, which I think may be on a list of matters to be resolved before the Small Business bill can be adopted. I’m not sure that – unless – it’s so fluid over there, it’s kinda hard to know whether or not Senator Paul’s motion to refer back, and then immediately refer to the, to the Senate – I think it’s the Foreign Relations [Committee] – but anyway, to immediately vote on the President had no authority to do what he did. And that’s, that has to be addressed before any resolution authorizing, or resolution supporting – Senator McCain, Senator Lieberman and I agree that, support this mission. I mean we’re all in support of the mission. So if there is an effort at a authorization resolution – hopefully we can come together on that if there is such an authorization. But there’s a lot of language which would have to be reviewed, and there would need to be set aside a significant amount of time in the Senate for that. And it may be, to some extent, overtaken by the event of the hand-off to NATO and the reduction of our presence. So that it may take away less of the immediacy of acting on something which is already past. Now that doesn’t mean that there’s not a continuing support – so it still would have some relevance, but less immediacy. Even a non-binding vote to express the Senate’s displeasure with the President’s usurpation of the war powers of Congress is too much self-government and separation of powers for Carl Levin, apparently. Mr. GLENNON. I think, Mr. Chairman, that Mr. Rohrabacher made an argument that I have heard many times, and I just wanted to get a response on the record because a lot of people seem to be persuaded by the argument that he made. His argument basically was this: Why do we need a War Powers Resolution if we have already got the authority under the Constitution simply not to continue appropriations for a war that we don’t like? I think a lot of your colleagues actually share that viewpoint, who have reservations about the whole idea of the War Powers Resolution. That may be one of the reasons that it hasn’t worked too well. I think there are two problems with Congressman Rohrabacher’s approach; and I am sorry he is not here to engage in this colloquy. Number one, the option of not voting for funds for a war really isn’t available unless you are willing to close down the Pentagon. You don’t — with very rare circumstances — get a simple supplemental, as you know, with money that goes explicitly and exclusively for the use of force. It is included in the Pentagon authorization or appropriations. So you are then locked into the kind of fight that Newt Gingrich had with Bill Clinton about whether you are basically going to close down the government over this particular dispute. That is not really an effective way of wielding the appropriations power. The other alternative is, as he suggested, to offer a rider, an amendment to an appropriations bill. As Lou [Fisher] pointed out, that was done seven times between 1973–1975 when Congress said that no funds may be authorized or appropriated under this or any other legislation to carry out military or combat operations in over or off the shores of South Vietnam, North Vietnam, Cambodia or Laos. The problem is, the President will veto that legislation and then you have got to override his veto by a two-thirds vote, creating the anomalous situation that you need a two-thirds vote to get out of a war, but only a majority vote to get into war. As Lou Fisher has often pointed out, that really stands on its head the whole intent of the Framers of the Constitution. It was quite the reverse. So Congressman Rohrabacher’s instinct really leads down, I think, two impractical cul-de-sacs, and the only way out of that is to enact framework legislation like the War Powers Resolution that makes the use of the appropriations for war powers practicable. One, part of the reason that we have gone off the rails in war powers is what we have done after World War II. Namely, we allow Presidents to go to war not by coming to Congress but by going to the U.N. Security Council, which Truman did in 1950 and which others have done since that time. I submit to you, you cannot have a President and the Senate, [through] the treaty process, adopt a procedure that eliminates you people, the House of Representatives; but that has been done, and it has been done repeatedly. Depending upon circumstances, the exercise of the legislative veto may indeed encroach upon the president’s constitutional powers. The Legal Adviser to the State Department told a House committee in 1975 that if the president has the power to put men into combat “that power could not be taken away by concurrent resolution because the power is constitutional in nature.”19 Surely it is too broad a proposition to claim that the president has an unrestricted power to put men into combat, but a strong case can be made for the president’s responsibility to defend his armed forces and to protect American lives abroad. On balance, the legislative veto in the War Powers Resolution is justified. Without it, Congress’s own constitutional powers could be gravely impaired. Recall that in 1973 a majority in both houses wanted to bring the war in Southeast Asia to a halt. Each legislative action was countered by a veto. A federal court argued that the failure of Congress to override the vetoes should not be taken as legislative authority to continue the war. Said Judge Judd: “It cannot be the rule that the President needs a vote of only one-third plus one of either House in order to conduct a war, but this would be the consequence of holding that Congress must override a Presidential veto in order to terminate hostilities which it has not authorized.”20 To insist that every legislative action must be presented to the president, and made subject to his veto power, would allow a president to conduct a war with minority backing. No such intention should be read into the Constitution. Where Congress is too divided, conflicted, or unsure to affirmatively authorize warfare, both the Constitution and the War Powers Resolution require that the United States not go to war [except to repel sudden attack]. What had in effect occurred [during the Clinton Administration’s air war against Yugoslavia in 1999] was that Congress had not wanted to specifically authorize the war because many members disagreed with it, but neither did it want to be responsible for forcing the President to terminate it. That situation was contemplated by the Resolution, which required explicit, affirmative authorization. Nonetheless, the judicial response to Campbell’s claims was that congressional refusal to authorize the war was insufficient to invoke judicial enforcement because “Congress has a broad range of legislative authority it can use to stop a President’s war making . . . .”17 Congress could have passed a law forbidding the use of U.S. forces in the Yugoslav campaign, or Congress could have cut off funds for continuing the war. Indeed, every time I argued a case seeking to enforce the constitutional or statutory mandate that Congress affirmatively authorize war — the Central American cases of the 1980s, the first Iraq War before Judge Greene in 1990 or the Kosovo case almost a decade later — judges said in effect “why should I enforce congressional war powers when Congress will not.” The answer I gave was that to require Congress to act affirmatively to stop a war reversed the Constitution’s presumption that the President was required to obtain explicit, affirmative congressional authorization to go to war, not that he or she could go to war unless Congress could muster a majority to stop the war. Congressional silence is sufficient constitutionally to deny the President authority to go to war; nonetheless it was insufficient to force either the President to terminate warfare or to get the Courts to do so on behalf of members of Congress. The [WPR-revising] statute [proposed in 2008 by Rep. Walter Jones] should also direct the courts to not apply the various non-justiciability doctrines that courts have relied on to abstain from ruling on war powers challenges in the past. A provision should be added similar to that contained in Senator Biden’s Use of Force bill providing that in any action brought by private plaintiffs or members of Congress seeking compliance with the provisions of this Act, the court shall not decline to make a determination on the merits based on the doctrine of political question or any other non-justiciability doctrine. The statute could also state that a presidential violation of the bill would create an impasse with Congress and that Congress’ view was that separation of powers principles required the Court to decide the merits of any challenge brought against an alleged violation. In the two wars against Iraq, soldiers who did have standing challenged presidential violations in court, but their claims were dismissed as presenting nonjusticiable political questions.26 While Congress cannot override any core Article III requirement, it can negate the prudential judicial concerns that the resolution of the issue should be left to the political branches to determine. Part of the purpose of the Commander in Chief Clause is to preserve civilian supremacy. Military commitments are not in the hands of admirals and generals but are placed in civilian leaders, including members of Congress. Lawmakers can at any time limit and terminate military commitments. The framers vested the decisive and ultimate powers of war and spending in the legislative branch. American democracy places the sovereign power in the people and entrusts to them the temporary delegation of that power to elected Senators and Representatives. Second, the decision to take the country to war is set aside for each member of Congress, from the Speaker to the newly elected lawmaker. On a decision of that gravity, every member is equal. No member has rank or special power. Third, a President and his executive aides should not be able to co-opt a small group of lawmakers, who might ”sign off” on a military commitment and thereby pledge House and Senate support. The most recent example of that danger is the ”Gang of Eight” that appeared to be supportive of the NSA surveillance program. Congressional leaders lack authority to imply or grant congressional support for a military operation. That decision is reserved to each member of Congress, including the most junior. The framers put their faith not in an all-wise, all-knowing Executive but in a republican form of government where sovereign power remains with the people and their interests are protected by the structure of separated powers and the operation of checks and balances. Does the modified Audit the Fed amendment of Bernie Sanders do the job?